This is the surviving door way to Cell B, the second of the twenty-five cells built around the Great Cloister by Henry Yevele. Construction on Cell B began on May 12, 1371. The carved stone doorway, food port, and original fourteenth century Flemish floor tiles remain today within the original monastic bricks. 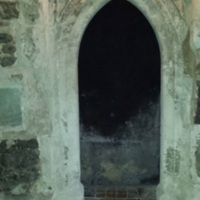 These parts stand as testament to the centrality of seclusion in the lives of Charterhouse's residents, the important role of wealthy donors in the monastery's expansion, as well as the radical changes wrought upon religious life that came with the Dissolution of the Monasteries. The cell's inhabitant received their daily meals through the port on the left of the frame to avoid contact human contact and further their isolation. The stone door frame contains shields in its upper left and right hand corners which displayed the coat of arms of the donor responsible for the funding of the cell's construction. Cell B once displayed the coat of arms of Sir William Walworth, a fishmonger and twice mayor of London. In return for the funding of the cell's construction, the resident monk would offer prayers for the soul of the donor. Furthermore, the expensive imported Flemish floor tiles are indicative of the fairly luxurious lodging made possible by the generosity of the donors to the Charterhouse. Finally, the band visible on the arch of the door way once contained verses of scripture, carved in Latin, that began with the letter of each cell, . After the monastery was suppressed by Henry VIII the Latin verses were hammered out of the arch, physically embodying the dissolution's abrogation of the ties to England's Catholic heritage. Note: Cell B's location within the monastic plan is represented by a black star in the "Map of Charterhouse in Medieval London." 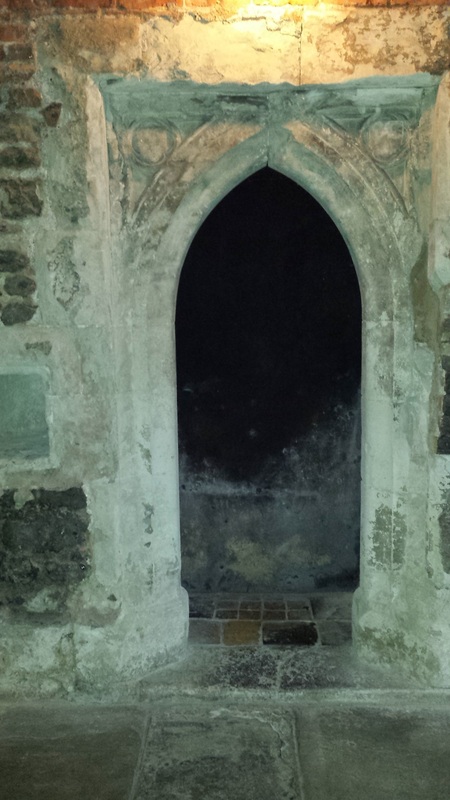 Photo by Joe O'Brien, “Monastic Cell at London Charterhouse,” Medieval London, accessed April 22, 2019, http://medievallondon.ace.fordham.edu/items/show/189.